The sound of the bell resounds through the air and the drowsy students are instantly reenergized. It is Friday afternoon, and the bell signifies what St. Andrew’s students have been anxiously awaiting all day: the pep rally. Students rush from their classrooms to the gym to obtain a front seat in the bleachers. However, some students lurk quietly in the library, sheltering themselves from the noise and excitement. Are pep rallies really as exciting as they seem? Why do some students prefer not to attend these school- wide celebrations? Many students that said they enjoy pep rallies elaborated on what makes pep rallies great. “The drum line is definitely the best part, because it has a beat and we all go wild; it gets the crowd going,” Senior Jack Ferguson said. “I think everybody, all of the students being really excited to be there and being hyped up for the football game makes [a pep rally] really great,” Spirit Leader Olivia Hardwick said. “There were a lot of acts to [the homecoming pep rally]; it was fun,” Senior Bernard Booth said. While Booth finds joy in pep rallies, he and others sometimes feel the energy can be a bit much. “I get really bothered by crowds, so attending pep rallies sounds stressful,” Booth said. “I also don’t like how [pep rallies] can be so loud and rowdy; I wish they’d just tone it down a little bit,” Shekoni said. It seems that the exact reasons why some people love pep rallies (the resounding beat of the drums, the excitement of the student body) are the exact reasons why some people dislike pep rallies. Because many people do not see the fun in pep rallies, the most logical question to ask is if everyone should be required to attend pep rallies. “[A pep rally] is really fun and a good way to raise school spirit,” Senior cheerleader Maggie Meeks said. It is clear that not all students enjoy the liveliness of a St. Andrew’s pep rally. The students that prefer to lurk quietly in the library during these times of celebration raise an interesting point: Should everyone be required to attend pep rallies? 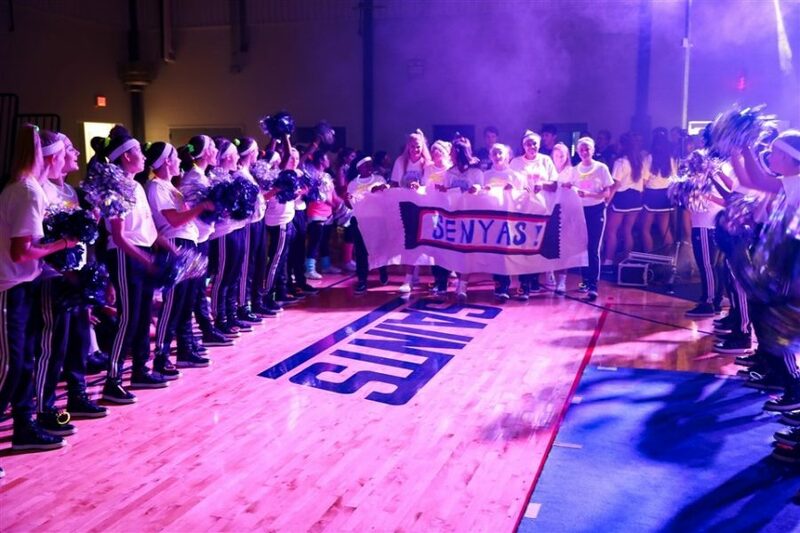 Would making pep rallies attendance- optional promote individualistic choices, or would giving the students the option not to attend pep rallies prove detrimental to the football team, and therefore, detrimental to overall school spirit?